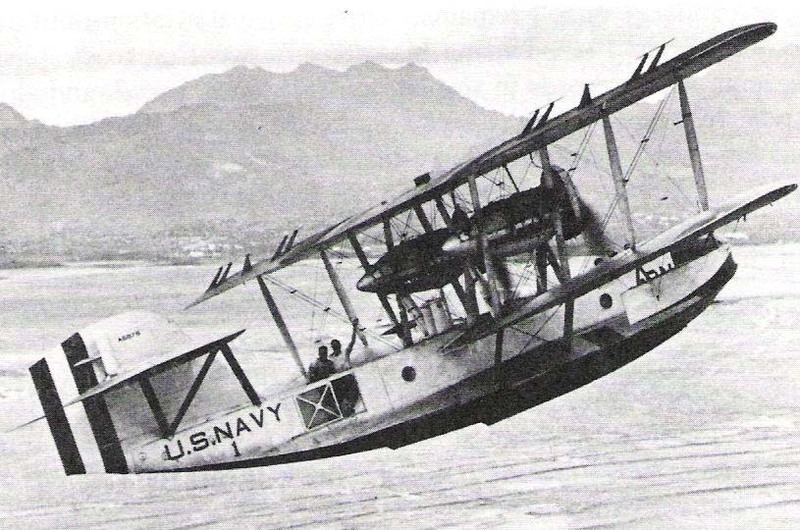 About 1450 on the afternoon of 31 August 1925, two PN-9 flying boats took off from the waters of San Pablo Bay headed out across the Golden Gates in the direction of Hawaii. It was an ambitious and dangerous undertaking, this non-stop flight from the West Coast to Honolulu. Army fliers on their way around the world the previous year had chosen the northern route from Alaska to Siberia; they had flown around the Pacific rather than over it. 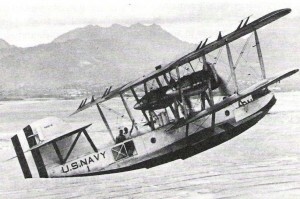 Even while the Army plans were enroute, the Commander Aircraft Squadrons, Scouting Fleet, had expressed the opinion that the proper way to make such a flight was by seaplane and requested that his organization be allowed to execute a round the world expedition of its own.1 Although this proposal was rejected2, CNO had already approved a project of the Bureau of Aeronautics to send four scouting aircraft from San Diego to Honolulu. As early as October 1923, Admiral Moffett of the Bureau of Aeronautics had submitted plans for a circuit of the globe by naval planes. The director of the War Plans Division of CNO to whom the proposal was referred prepared a memorandum in which he set forth the advantages and disadvantages of the flight and concluded that the letter outweighed the former, but he did modify his opinion to the extent that the Pacific portion of the project had real value for the navy. In the meantime, BuAer was going ahead with its earlier proposal and the PN-9s were nearing completion. In March a memorandum set forth the tests to be given the planes and the middle of the following month Commander Mitscher prepared a set of tentative plans which were approved by CNO on 20 April, and which by including a list of vessels which would be available in the late summer, answered the principal objection of Cincus that ships of the fleet could not be spared for guard duty along the line of flight. The same document also recommended that the crews for the PN-9s be selected from the Aircraft Squadrons, Scouting Fleet, and the PB-1 manned by members of the Aircraft squadrons, Battle Fleet. The planes and crews were to be assembled at San Diego as soon after 1 June as possible and be ready to start on 28 August. The test of the PN-9s were carried out at Philadelphia in April and May under Lieutenant C. H. Schilhauer, who on 2 May took one up to set a world’s record for seaplane endurance of 28 hours, 35 minutes. The planes were then dismantled and shipped by freighter to San Diego, the Packard 1500 engines being returned to the manufacturer for servicing. Since Captain Moses left practically everything concerning the aircraft, their equipment, and training of the flight crews to Rodgers, his detailed plans were really instructions for the guard ships and the shore based activities necessary to insure the success of the flight. Because it had not yet been determined whether the start would be made from San Diego or San Francisco, two sets of guard stations were given, with the notation that all ships would be informed of the exact route by 20 August. The remainder of the document set forth communications procedures, what actions should be taken in case of a forced landing, and indicated that at the expected time of passing, each guard ship would make heavy smoke by day and use its searchlight by night. Particular care was to be exercised beforehand to insure proper calibration of radio compasses because of the successful use of these instruments in the NC0-4 trans-Atlantic flight in 1919. Captain Moses’ instruction also named Lieutenants A. Crinkley and C. H. Schildhauer as alternate pilots. As is customary with such ventures, there was a good deal of last minute scramble and some improvisation in collecting equipment. Two earth inductor compasses were borrowed from the Army, which had used them on its round-the-world flight.18 although standard wind drift sights were included in the equipment of the planes, an improvised instrument built around an ordinary machine gun sight proved more efficient on the flight itself. About 1100 the next morning the two planes were towed to the head of San Pablo Bay, a meal being served on the way. At 1400 both planes cast off from their towing boats and Admiral Moffett, Captain Moses, and Colonel Lahm, the last being the commander of Crissy Field and also the representative of the National Aeronautic Association, came alongside to bid the crews farewell and to put aboard the sealed barographs necessary to establish official records. At about 1440, the PN-9 No. 1 started its run but failed to get off and circled around for another try. In the meantime the PN-9 No. 3 under Lieutenant Snody got into the air about 1444, and Cdr. Rodgers followed in the PN-9 No. 1 eight minutes later. After his successful take-off Lieutenant Snody picked up his course and at 1725 passed five miles south of the WILLIAM JONES. Shortly afterwards he observed the PN-9 No. 1 flying very low. After his difficulties in taking-off, Rodgers’ problem largely boiled down to one of navigation, with which he experienced relatively little difficulty. During the night, he noticed that the exhaust flame of the port engine was yellowish in color rather than blue, indicating that it was not functioning properly, but it caused no noticeable trouble in the behavior of the plane. Also, the winds were lighter than had been expected. The only alarming feature was the gas consumption which averaged about six gallons per hour higher than indicated by the test flights. This may have resulted from the fact that the port engine consumed twice as much oil as the starboard engine and was obviously not running as efficiently. Also a different type of sparkplug and a different spark setting were used than on the endurance flight of May in Philadelphia. Before the 1,200 mile mark was reached, Rodgers concluded that he would have to land beside one of the guard ships and refuel. Since he had sighted all the guard ships without difficulty and was experiencing no difficulty in maintaining his course, there was no particular cause for alarm. When he passed the RENO, at 1,400 miles out, Rodgers figured that he had sufficient gasoline to reach the AROOSTOOK 400 miles farther on and still have sufficient fuel for 40 minutes additional flying. Although ever since leaving San Francisco the radio compass bearings from the ships had been erratic at distances greater than 50 miles, it had not caused the flyers any concern because they had not sough to pass directly over the guard ships but only to remain reasonably close to the prescribed course. When it became necessary to refuel, however the problem changed to that of locating and landing beside a particular vessel, and the radio compass bearing became more important particularly as the presence of rain squalls made visual sighting difficult. What happened after the PN-9 No. 1 passed the FARRAGUT is not clear either from Rodger’s report or the account from the commanding officer of the AROOSTOOK. Once on the water Rodgers and his companions examined the plane and found it in good condition. Of the rations, 12 ham sandwiches, 10 quarts of water rand two of coffee remained in addition to three pounds of hardtack and six pounds of canned corn beef brought along for just such an emergency. When on the following morning, they had not been rescued, the fabric was stripped from the lower wing to prevent it from breaking under the weight of water that swept across it. The cloth was then fashioned into sails and a course set for the Islands. Connell rigged leeboards from the metal floor boards of the plane, enabling it to steer a course 15 degrees from the wind. Unfortunately, the radio sending apparatus worked on a wind driver generator that ceased functioning when the PN-9 No. 1 landed, and even though Chief Stantz labored with resolution and skill until he had built al rudimentary sending set, the plane never succeeded in getting into communication with those who were searching for it. While the PN-9 sailed on at two knots, an intensive search began under the direction of Commander VanAuken of the AROOSTOOK. The LANGLEY hurried up from the eastward and her planes conducted daily search missions over the adjoining waters. Submarines and patrol planes from the Hawaiian Islands joined in and even a squadron of destroyers accompanying the fleet on its return from Australia covered the areas south of the islands. As Rodgers commented, he had all the equipment necessary to expert navigation. In addition, he possessed a thorough knowledge of the area from long acquaintance so that he took maximum advantage of wind and currents, but no matter how great the skill of those on board, a seaplane was far from being an ideal sailing vessel. At most, by use of ailerons and rudder, a course of five degrees from the direction of the wind could be made good, until on the seventh day Lieutenant Connell rigged leeboards made from metal floor boards in the plane. With the 20 square feet of keel thus provided, a course of 15 degrees from the wind could be attained. The improvement came too late to change the destination of Kauai, upon which Commander Rodgers determined at the outset. To reach this island meant sailing north of the entire Hawaiian chain, along which they might have been discovered at any point. On the second day at about 0800, a commercial steamer passed within five miles, but despite flares, Very pistols, smoke and frantic signaling, failed to spot them probably because the plane lay between the vessel and the sun which was low on the horizon. On 9 September, the Island of Oahu was sighted and two planes were observed obviously searching for something along the north shore, and the following day, Kauai was observed ahead, and the plane discovered by the R-4 that afternoon. Although, when picked up, all the men appeared in good condition, they had suffered for several days from lack of water. A small still carried for emergency operated on gasoline of which there was a total lack. It was, however, made to produce a quart by burning all the wood that could be stripped from the aircraft. Because the corned beef proved indigestible and attempts to fish netted no results, the scanty food supply disappeared on the second day, but was not hunger but thirst that weakened the men most, until a lucky rain squall on the eighth day replenished the supply and rapidly restored both declining vigor and flagging spirits. When the news of the safe arrival reached the Navy Department, a flood of messages began arriving from agencies of the government, local officials of all sorts, foreign governments, and individuals. The first wave of congratulatory telegrams was followed by invitations for Commander Rodgers and his crew to appear at civic functions all over the nation. After the receptions were over, there still remained the reports to write, the conclusions to draw. After reviewing his experience, Rodgers recommended that improvements be made in the techniques and equipment for aerial navigation over the open sea and particularly in the taking of radio compass bearings from ships. As in most ventures that nearly succeed, a good many ifs remain in the minds of all concerned. It may be said that, even if the AROOSTOOK had not given erroneous bearings, and the plane had carried the added 50 gallons of fuel consumed in the first effort to take-off, it would not have reached Hawaii without a stop. Unfortunately the winds, although favorable, did not reach the velocities assumed in the plans and did not aid as much as had been expected. In fact, when passing the FARRAGUT, the ship before the AROOSTOOK, Commander Rodgers was two hours behind the schedule. The really important failure however, was the inability of the plane to reach the efficiency of operation attained during the test flight of May. If it had, Commander Rodgers would in all probability have achieved his goal despite the other adverse factors, and the Navy would have proved its ability to fly to Hawaii as well as to sail there. 2 Cincus in his endorsement to ComAirRons, ScoFlt. Conf., ltr., stated that the primary requirement of the Navy was for the development of aviation as an integral part of the Fleet rather than for spectacular flights. Cincus conf., ltr., S-6-1(1) to SecNav. 7 May 1924 (SC 111-99). This opinion received the approval of SecNav who declared, “ . . . it is now the policy of the Department to devote all energies to solving the problems that look to an improvement of aviation in the Fleet.” SecNav conf., ltr, to ComAirRons, ScoFlt, 17 May 1924 (SC 111-99). 3 BuAer sec. ltr., Aer-P-BB, 804-6, to SecNav, 31 October 1923. DirWarPlans sec. memo., Op-12-CD, 3 November 1923. Chief BuAer sec.mem., no serial, 5 November 1923. Sec. memo., Op-38-6-EMW, 7 November 1923. BuAer sec. ltr., Aer0-M-12—AQ, 804-28, to CNO, 23 November 1923. CNO sec. ltr., Op-13A, to BuAer, 27 November 1923. CNO sec. ltr., Op-38-C-MW/5/12, to BuAer, 25 April 1924, All the above are to be found in the CNO files, (SC) 111-99. 4 BuAer ltr., Aer-M-11-AAM, RNAF-73, to the Naval Aircraft Factory, 27 June 1924. Lt. Comdr. J. H. Strong ltr., no serial, to ComAirRons, BatFlt., 8 October 1925. 5 BuAer ltr., Aer-M-19-CRP 201-2, to CO VO-2, 13 December 1924. (A4-3(7-1). 6 A. H. Ford, Director Pan Pacific Union, to Admiral Moffett, 2 October 1924. (Ar-3 (7-1). Comdr. Rodgers, who commanded the flight a year later expressed the opinion that the flight through the islands of the Pacific was practicable but that between San Francisco and Honolulu a “stunt”. Lt. Hegenberger of the Army disagreed with Rodgers as to the practicality of a flight from the mainland to Hawaii. Of Dr. Stead, Sir Joseph Carruthers, Chief of the Privy Council of New South Wales, said, “But whatever is done, keep clear of D. Stead, as he is not seriously or favorably regarded by official circles here. . . he is a bit of a messer and none to practical as a doer. . .” A. H. Ford, Director, Pan Pacific Union, to Sec Navy, 27 February 1925. (A4-3(7-1). 7 BuAer ltr., Aer-P-BB, 804-6, to SecNav, 8 November 1924. CNO ltr., Op-13A-LMS, 26983-1680, to Cincus, 10 December 1924. Cincus ltr., A4-3/F(7-6), to CNO, 27 December 1924. The route proposed was that used in 1941 after the outbreak of hostilities in World War II. (A4-3(7-1). 8 The proposal of the Pan-Pacific Union finally frittered out in a recommendation from Admiral Moffett that Cincus have his aviation side investigate the possibilities of such a flight and consult with Australian and New Zealand authorities when the Fleet visited that area in the summer of 1925. BuAer ltr., Aer-M-BB, 804-6, to Cincus, 8 April 1925. (A4-3(7-1). 9 Memo., Aer-P-1-MRC, 804-6, to Chief, BuAer., 27 March 1925. BuAer ltr., Aer-P-BB, 804-6/606-10, to CNO, 14 April 1925. CNO ltr., Op-38-C-MW, 26983-1680:2, to BuAer, 20 April 1925. (A4-3(7-1). 10 CNO ltr., Op-38-C-MW, 26983-1680:2, to Cincus, 18 April 1925. (A4-3(7-1). 11 ComScoFlt radiogram to BuAer, 22 May 1925. ComAirRons, ScoFlt. Ltr., P16/pp(504), to BuNav, 2 June 1925. Lt. Comdr. J. H. Strong ltr., no serial, to ComAirRons, Bat Flt., 8 October 1925. (A4-3(7-1). The officers from Scouting Fleet were chosen on the basis of their experience with heavy seaplanes, and all, except Rodgers, had over a thousand hours flying time. 12 BuAer ltr., Aer-M-12-AQ, VPN9/F1-1, VPN9/A4, 804-6, to CO NAS, San Diego, 5 June 1925. (A4-3(7-1). Annual Report of Chief of Bureau of Aeronautics, 1925, p. 15. 13 BuAer des., 9513, to ComAirRons, Bat Flt., 13 June 1925. (A4-3(7-1). 14 Flight Unit Commander and Commanding Officer, PN-9 No. 1, no serial, to Flight Project Commander, 31 October 1935. (A4-3(7-1). Rodgers also mentioned Mr. H. S. Conklin for his efforts. 15 Commander, PN-9 No. 3, ltr., no serial, to Commander, flight Unit, 23 September 1925. Lt. Comdr. J. H. Strong ltr., no serial, to all concerned (Instructions West Coast-Hawaii Non-Stop Seaplane Flight), 2 July 1925. (A4-3(7-1). Capt Moses left Hawaii on 5 August aboard the LAVILLETTE. ComDesDiv 30 des., 0102, to CNO, 3 August 1925. (A4-3(7-1). 16 ComAirRons, ScoFlt, ltr., P16-4/MM(971), to BuNav, 27 June 1925. Commander PN-9 No. 3 ltr., no serial, to Commander flight Unit, of 23 September 1925 Rep. Phil D. Swing telegram to SecNav, 30 September 1925. The crew of the PB-1 was composed of Lieutenant Commander J. H. Strong, Lieutenants Ricco Botta and R. E. Davison, and three enlisted men. Lt. Comdr. J. H. Strong ltr., no serial to ComAirRons, BatFlt., 8 October 1925. (A4-3(7-1). 17 Commander Flight Unit radiogram, 1026, 27 July 1925. Lieut. F. W. Wead ltr. No serial, to ComAirRons, BatFlt., 7 August 1925. (A4-3(7-1). 19 Flight Unit Commander and Commander PN-9 No. 1 no serial, to Flight Project Commander, 31 October 1925, (A4-3(7-1). 20 NAS, San Diego, des., 1023, to BuAer, 23 August 1925. Commander flight Project des., no no. to BuAer, 24 August 1925. (A4-3(7-1). 21 LT. Comdr. J. H. Strong, no serial to ComAirRons, BatFlt., 8 October 1925. DNO deal, 3803, to BuAer., 3 September 1925. Capt. S. E. Moses to Admiral Moffett, 10 September 1925. 22 Information for Merchant Ships, West Coast-Hawaii Non-Stop Seaplane Flight, no serial, no date. S.O.P., A.S.B.F., Op-PAW (Supplementary Instructions for West Coast-Hawaii Flight, Arrangements for Western End of Flight, 11 August 1925, (A4-3(7-1). 23 ComAirRons, BatFlt ltr. VB/A4-3(5918), to CinCBatFlt., 30 November 1925. (A4-3(7-1). This document carries as enclosures the reports of all ships assigned to the operations. 24 Snody also reported vibration in one propeller which he attributed to a slight injury from the water beaten up during the take-off. Examination after landing indicated that the oil pressure line of the port engine was severed. Commander PN-9 No. 3, no serial, to Flight Unit commander, 233 September 1925. Lieut. A. Gavin, no serial, to Commander flight Project, 30 September 1925. The main damage to the PN-9 No. 3 occurred when it collided with the WILLIAM JONES in attempting to pick up the tow. 25 Rodgers in his report considers the question of whether he received reciprocal bearings (reverse as he called them) and finally came to conclusion that the bearings were simply erroneous, which seems the best explanation, because a radio compass bearing taken from Hilo at 1532, just three minutes before the plane turned north, placed it at the same point as Rodgers’ dead reckoning. Also, the position of landing, 24o 04’ N, 152o 04’ W, leads to the conclusion that Rodgers had been moving north from the line of flight for some time. The failure of the AROOSTOOK was particularly unfortunate because as Rodgers pointed out, its commanding officer had distinguished himself during the training period by his desire to have everything right. Flight Unit Commander and Commanding Officer, PN-9 No. 1 ltr, no serial, to Flight Project commander, 31 October 1925. CO, USS AROOSTOOK, ltr., GM3-A16-3 to ComAirRons, BatFlt., 11 September 1925. (A4-3(7-1). 26 Rodgers in his report cited in note 24 figured the distance as 1,860 nautical miles. The Federation Aeronautique Internationale, after examining the relative documents, allowed 1,841 statute miles to set a world’s seaplane record for airline distance. (Aircraft Year book, 1927, New York, 1927). 27 See Rodgers’ report cited in note 25. 28 ComAirRons, BatFlt., (Com. Flight Project), no serial, to CinC, BatFlt, no date. (A4-3(7-1). This is the official report and with its enclosures contains all the documents relative to the search. 29 See Rodgers’ report cited in note 26. A little difficulty was encountered after the arrival at Nawiliwili. Inside the breakwater was a reef that the submarine was unable to cross. The only anchor available did not possess sufficient weight to keep the plane from drifting, and disaster might have struck, if two Hawaiians had not come out in a motor boat to help. Just about the time that a rope was made fast to the rescue boat, its pilot discovered that he was drifting toward the reef and put off at full speed. In his confusion, he crossed the reef dragging the plane behind him and then recrossed it back again, on which occasion the aircraft bumped but sustained no vital injury. The third crossing of the reef proved uneventful and the PN-9 No. 1 reached a safe anchorage in the harbor at last. 30 For the messages and invitations see file A-4(7-1). CNO des., 3814, to CinC BatFlt., 14 September 1925, contains the order to send the flyers to San Francisco on a battleship. 31 Commander Flight Unit and Commanding Officer PN-9 No. 1, no serial, to Commander flight Project, 31 October 1925. (A4-3(7-1). 32 ComAirRons, BatFlt., (Com. Flight Project), no serial, to CinC, BatFlt., no date. (A4-3(7-1).